Watch the recording of our livestream now to find out more about the YES Group and our vision. 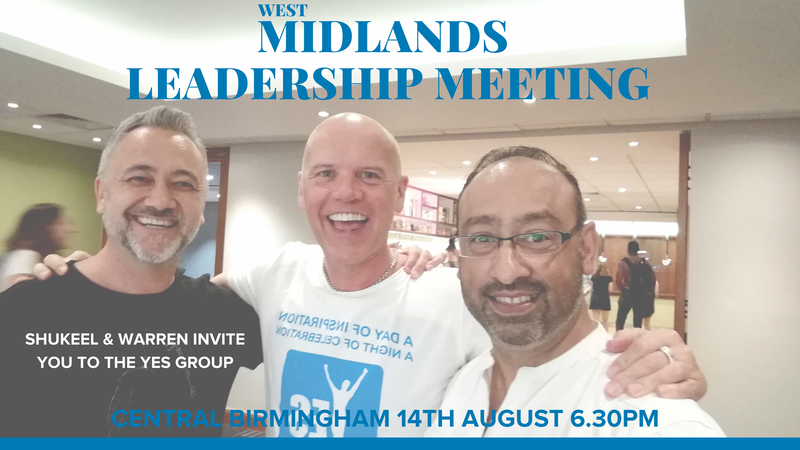 Shukeel Chohan & Warren Knight are bringing the UK’s premier personal development organisation to the West Midlands, including Birmingham, Worcester, Coventry, Stratford, Warwick, Hereford, and Telford. This meet-up is designed to build the UK’s premier leadership team, bringing together vibrant people who celebrate our successes, get inspired, educated and engage with the world’s finest speakers and leaders from the personal development, health, wealth, growth and contribution arenas. Join our community of like-minded individuals to accelerate your success, to grow and contribute, to thrive and have fun. We will also require people who are willing to support, collaborate on a monthly basis. If this is YOU we would love to see you on Tuesday 14th August to learn connect and grow! Please register your place HERE – we look forward to seeing you! If you can’t make the 14th, don’t worry just let us know by getting a ticket and we will personally speak with you after the meet-up.